There is nothing quite like seeing something from childhood come to life. At the Niswonger Performing Arts Center of Northwest Ohio, staff members love being able to share that feeling with the latest generation. 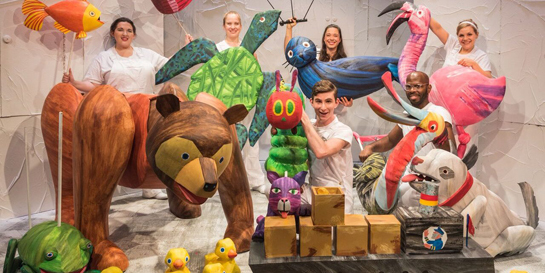 The children’s book classic The Very Hungry Caterpillar has been transformed into a live show through the magic of puppetry and is coming to the Niswonger for two family-friendly showtimes at 2 and 5 p.m. Sunday, March 10, 2019. Tickets for the show are releasing for purchase as of today. The Very Hungry Caterpillar, presented by Jeffery-Mohr Family Dentistry, is a story by author-illustrator, Eric Carle that has delighted generations of readers since it was first published in 1969, selling more than 43 million copies worldwide. Carle’s well-known books have captivated readers with his iconic colorful hand-painted tissue paper collage illustrations and distinctively simple stories. His work has introduced generations of children to a bigger, brighter world — and to their first experience of reading. Now, this timeless classic has made its way off the page and onto the stage. Created by Jonathan Rockefeller, the critically acclaimed production of The Very Hungry Caterpillar features a menagerie of 75 lovable puppets faithfully adapting four characters of Eric Carle’s stories — Brown Bear, Brown Bear, 10 Little Rubber Ducks, The Very Lonely Firefly — and, of course, the star of the show – The Very Hungry Caterpillar. Along with Presenting Sponsor Jeffery-Mohr Dentistry, Supporting Sponsors include Mercer In-Sight Family Eye Care and Van Wert Family Eye Care, and Betsey’s Boutique. NPAC Family shows are Sponsored by the Robideau family. Sponsors for the Ignite 2018-19 season include Chuck and Karen Koch, StateWide Ford Lincoln, and Van Wert Federal Savings Bank. Tickets for The Very Hungry Caterpillar can be purchased through the Box Office, 10 a.m.-5 p.m., Monday through Friday, by calling 419.238.6722 during those hours, or online at NPACVW.ORG.